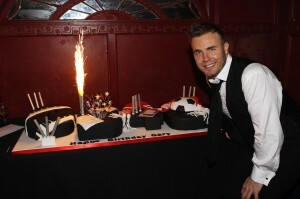 Cakes by Robin made a 5ft long birthday cake and delivered it to Gary Barlow’s 40th birthday party at the Shepherd’s Bush Empire. 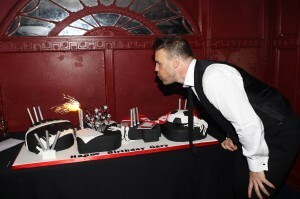 His family presented him with the half chocolate, half Victoria sponge creation while guests including Claudia Schiffer, Gwyneth Paltrow, James Corden, the Take That boys and Alesha Dixon sang Happy Birthday. 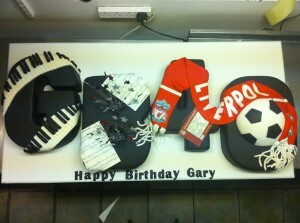 His birthday cake was designed to incorporate lots of his interests including piano keys, a football and a Liverpool FC scarf and song lyrics on top of cakes carved in the shape of GB40. The cake before the four of us needed to carry it delivered it to the venue!